An interesting sample of "double-cancellation". 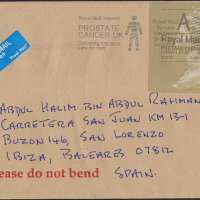 It is a known fact that a mail that uses Golden Horizon Label is considered "cancelled and correct fee collected" and the no longer require any other form of cancellation. 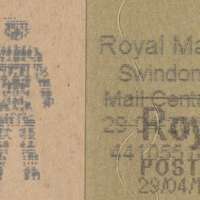 However, this interesting piece was second-cancelled by machine with PROSTATE CANCER UK, which the postmark itself was different that 2013's PROSTATE CANCER UK. The font and side-switching are very noticeable. New font, side switched and processed time removed. 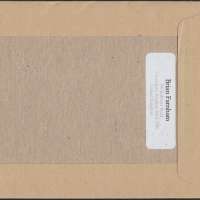 Horizon Label is stamp/label that are oversized Machins measuring 59 x 64.5 mm and printed in pale ‘gold’ with full bleed (no white frame around design). It was introduced in June 2009. 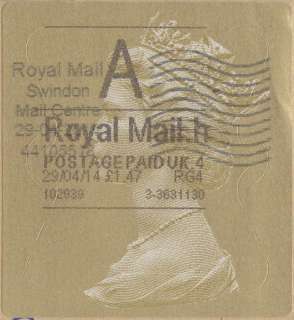 The complete label was overprinted with a repeating iridescent wavy line ROYAL MAIL pattern for the background while the head itself had a different pattern.